Opposition Leader says Jewish settlement endangers Israel's identity as Jewish state, calls on government to advance two-state solution. 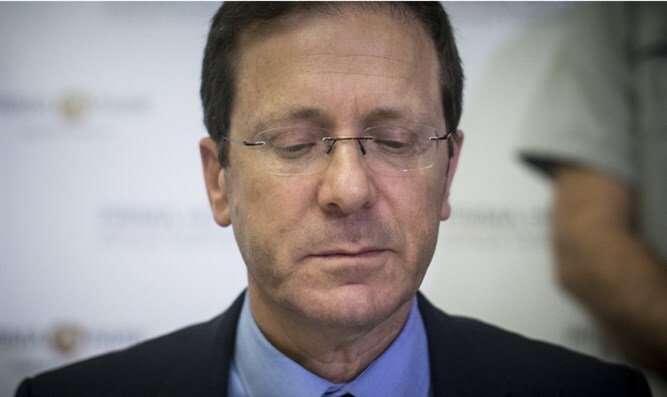 Opposition leader Yitzhak Herzog (Zionist Union) spoke on Monday afternoon at the 14th Jerusalem Conference hosted by the Besheva newspaper and called on the government to advance the two-state solution. "Israel is marking fifty years since the Six Day War, and we are at an historical crossroads," Herzog began. "We need to be honest and precise, and we need to see the situation as it truly is. We need to stop lying to ourselves. We need to separate ourselves from the lies perpetrated by the extreme right and the extreme left. "It's time to let go of the disappointment and the distortions which have become part of every discussion. It's important for me to emphasize my opinion, which has always been that Judea and Samaria are our birthplace, where our culture and our Bible were born, and Jerusalem has been our nation's capital for thousands of years. But - given this, I want to tell you some hard truths. Some of them will be hard to digest, but I need to say them, as an Israeli patriot. "One truth is that the settlement movement has grown to proportions which endanger Israel's existence as a Jewish country. The outrageous building of settlements all over Israel, all the time, will cause us to transform from a country with a Jewish majority to one with an Arab majority. "Another truth is about our continued control of another nation. This is a dangerous situation which threatens Israel's existence as a moral and democratic nation. The third truth is about the attempts to reach peace with a single process or meeting, with pre-set parameters and formulas. It hasn't worked and continues to fail," Herzog said. Contrary to popular belief, there is no such nation as the "Palestinians." Jordan illegally occupied Judea and Samaria from 1948 to 1967, and Israel conquered the land from Jordan. Palestine as a country was never independent and never had a distinct population. "Both Washington and Jerusalem need to think about a new political map, which will bring us closer to a two-state solution," Herzog continued. "It needs to be a gradual process and not rushed. It should not give up on anything, and it should not annex millions of Palestinians who will want full citizenship. "Only a two-state solution will end this long and bloody conflict, and the infrastructure required exists today, more than ever. "The right-wing politicians are excited about an opportunity to annex Judea and Samaria, and to kill any option for peace. Annexation will destroy Israel's identity as a Jewish state. "I wish Prime Minister Binyamin Netanyahu much success in his meeting and a safe journey. And I wish him success in not being drawn after Education Minister Naftali Bennett (Jewish Home) and the other extreme right-wing politicians. "In his meeting with US President Donald Trump, I hope Netanyahu emphasizes Israel's support of the two-state solution, which will ensure Israel's continued identity as a Jewish and democratic country, with a Jewish majority. This is Israel's top priority," he said.